A lone wolf stalked the lamb who had strayed from its mother. Normally the whole wolf-pack would hunt full-grown sheep, but in this case opportunity would be grasped by the hungry beast. 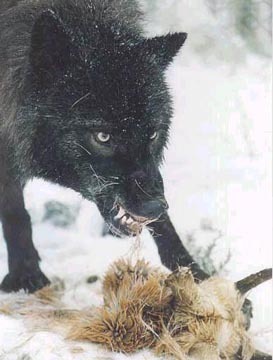 The wolf easily takes down the lamb and tears out its throat. The gurgling of blood had not yet ceased as the wolf devoured the lambs hindquarters. An hour later, the wolf was gone. 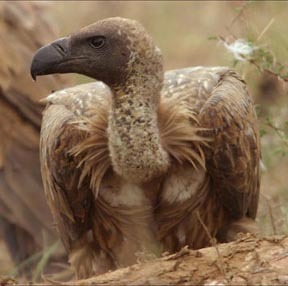 Vultures picked over the leftovers of the wolf's meal, squawking and fighting over the remaining tidbits. The shepherds of Ruritania had a problem. Their sheep were being killed, and they didn't know how or why. Young Naomi came upon the poor lambs carcass, vultures quibbling over the last remnants of gut and sinew. She called to her father; both sadly observed the grisly scene. "Why did those birds kill our poor little lamb?" asked Naomi. "I don't know," her father replied. "Maybe birds are just bad, evil animals." This was convention wisdom among shepherds, and most people in the village. What else were they to think? After all, whenever they found dead sheep, they found birds or evidence of birds picking at the carcasses. Literate people had long written about the dangers of birds, how they picked the eyes out of sheep, pulled out their entrails, and ate of the nastiest and most rotten parts of dead animals. There were many tracts about birdish greed, birdish ambition, and the exploitation of sheep by birds. Speechmakers loved to expound on unethical birdly practices and the dastardly crimes of birds. Of course there were a few naysayers. Some hunters and thinkers with a scientific mindset went out at night, hid in blinds, and observed. They found something that the villagers had not seen and refused to believe - that it was wolves, not birds, that were killing the sheep. These dissenting few also made another impertinent observation - that not all birds ate the flesh of dead animals. They claimed that most birds ate seeds and worms and insects and berries, and only a minority of bird species feed on carrion. Those men were naturally treated as fools by most villagers. A bird is a bird, the village school-teachers said. We know the nature of those evil avarian creatures. We've seen with our own eyes how they congregate and dance on death. Some activists went so far as to say that all birds should be poisoned, and killed on sight by any means necessary. Little Naomi wrote an essay called "The Shock Doctrine: Disaster Birdism." Lou, a second grader, wrote about how birds cause sheep herding jobs to be shipped to other villages. Ariana's term paper was about how birdish greed is ruining the village. Even wolf hunters who knew the truth firsthand got in on the act; Reverend Perkins wrote a sermon called "Confessions of a Bovarian Hit Man," in which he confessed working for evil birds, and repented of his sins. He coined a new word, "birdocracy," to describe the terrible birdy conspiracy. Most villagers concurred, even though the reasoning behind this explanation of sheep-killing was rather conspicuously flawed. But we must understand - most villagers did not go out at night. To most villagers, unexperienced and grossly ignorant of the ways of the wild, wolves were cute relatives of their pet dogs. They simply could not believe that the relatives of their best friends, their beloved pets, could possibly be the real killers of sheep. Sure, there may be some individual bad apples - wolves gone bad - but most wolves are benevolent animals, they thought, incapable of doing harm. And how could you believe crazies who spend all night in the cold, huddling in hunting blinds. Those fanatics were no doubt hallucinating. There was another phenomena even harder for the villagers to explain - wolf packs. There were rumors of groups of animals which cooperated in killing sheep and other farm animals. People talked about these animal gangs frequently, even though they hadn't seen them directly, not wanting to stay up that late at night. The common opinion was that it was flocks of birds responsible for killing the bigger animals. The "flocks" had various colorful names, such as Winged Terrorist Organization (WTO), or Winged Banditos. The whole flock myth may seem to you and I as amazingly self-deluding; the tracks of wolves were invariably observed around kills. But then again, there were also plenty of vulture footprints, too, sometimes all but obscuring the underlying paw prints. Yes, Ruritania had a problem. Some would say the problem is in perception, or understanding. Some will blame the culture, the history, the teachers, or the philosophers. Once people see birds - all birds - as an intractable enemy, and have vested their efforts and beliefs in this enmity, it is hard to change. Admitting error, rejecting tradition opinions, can be too difficult. Changing one's mind perhaps requires too much courage and integrity for most people to muster. Reality is the ultimate judge, yet Ruritanians bury their heads in the dirt to evade it. But of course Ruritania is a fictional place, and these villagers are fictional people. Surely we wouldn't be that stupid. Most birds are not vultures. Most firms (even corporations) are not government crony corporations. The real sheep-killers are wolves, not birds. The real man-killers are governments, not firms. The murderous gangs are wolf-packs, not bird flocks. The murderous gangs are cartels of governments, not cartels of corporations. The members of the WTO are governments, not firms. The World Bank is owned by governments, not firms.